The N2800 is the successor of the N2200XXX. Keeping the SD card reader and elegant LED design, the N2800 has been tweaked after user’s demands. The N2800 will be one of the first Intel® Atom™ D2.13GHz based NAS! Multimedia-oriented, powerful, silent and well-designed: this NAS is very versatile. Connect it to the TV of the living room to play HD content and/or use it as a backup center for a couple of computers in your small office, possibilities are endless! 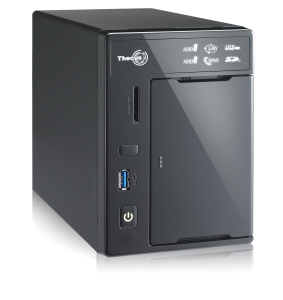 Thecus was the first to launch NAS compatible with USB 3.0 for early adopters. Now that the technology has matured and more USB 3.0 devices exist on the market, it was time to embed it by default! The N2800 has one USB 3.0 port, which are at least 10 times faster than USB 2.0. Associated with large amounts of DDR3, the new Atom™ will provide much better performance. Reaching the limits of Gigabit bandwidth on a “small NAS” is already a standard in the industry, thanks to the N2200XXX, but what if (and you will) want your NAS to give you more? Multi-user environment, web hosting, intense backup, data encryption, application serving, heavy RAID computations, and HD multimedia streaming: welcome to the world of smooth multi-tasking! Ideal for small installations and/or mobile users, this feature is designed to lower the total cost of ownership of your network architecture.